Do know all of the terms that you are bound to encounter when you are opting for online marketing? After all, the terminology can become quite confusing for a layman. You may find that a list or a guide for some of the more common terms is a handy tool to have at your disposal. These terms can be unfamiliar unless you have spent a considerable amount of time in researching online marketing. If you do possess training in this field, then you will have no problems whatsoever. On the other hand, you may find it uncomfortable asking others when you are unsure of the terminology. It is also known as split testing. A/B testing allows you to compare two versions of a webpage to understand which one of them has a better performance. In this testing, you will be showcasing the two versions at the same time to the same kind of visitors. The webpage version that brings in more conversions will be the better option. Bandwidth can be defined as the transmission capacity of the network, the server or your web hosting service. It takes into account the upload and the download speed. By getting a higher bandwidth from the web hosting service provider, you can ensure that your website loads up faster. On the other hand, you will have to pay more money for higher bandwidths. When people start talking about your business, the product or the service that you are offering on social media, you are actually getting social proof for the respective item. In other words, more people will start taking notice of your product or service as others are talking about it. Social proof can be a good way to increase sales and conversions in online marketing. A splash page is the specific webpage which is viewed first by the visitors before they can move on to the rest of the website. You can use splash pages to promote special offers, specific products, particular services or even your company. You can even use them to inform the visitors if they need to follow specific instructions or download programs in order to enjoy the rest of your website. It is the tendency of a particular piece of information to be distributed and circulated incredibly rapidly among internet users. A viral piece will also reach a wide user base. Almost any media can go viral such as images, videos or even audio and text. If your content goes viral, it will receive a huge amount of attention. A good user experience ensures that the person visiting your website does not have any problem whatsoever when using it. A good user experience means that the visitors will actually enjoy the website as it is easy to use. In order for your website to become a successful vehicle of your sales, you need to ensure it offers excellent user experience. 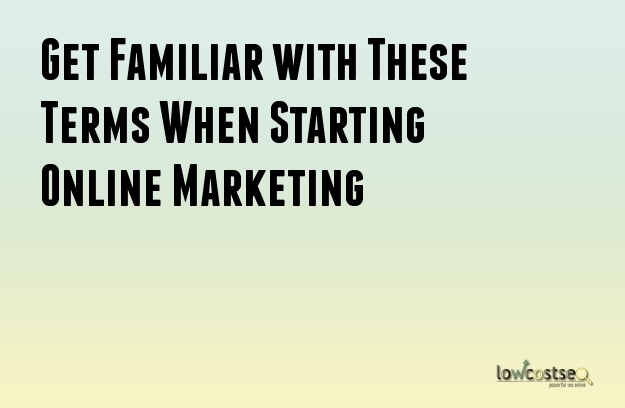 Simply being familiar with these terms may not make your online marketing strategy a success. Nonetheless, it can certainly make achieving success a lot easier.